In the photo-album there are a lot of pictures of the period 1994-2006 ( What happened before ). In Kortom - Voyage and cruising notes we mention the equipment of Nehalinnia for the voyage to Greece ( charts, pilots etc ). In no time we realise that our hope, to bring the boat in the gulf of Volos, isn't an evidence. See PROJECT. Autumn 1996. We are on the way to start the big work. We sail the boat from Nieuwpoort to Gent. Nehalinnia will be close to our home. For many friends, sceptically looking to us, we are reconstructing a boat around ... a dream! 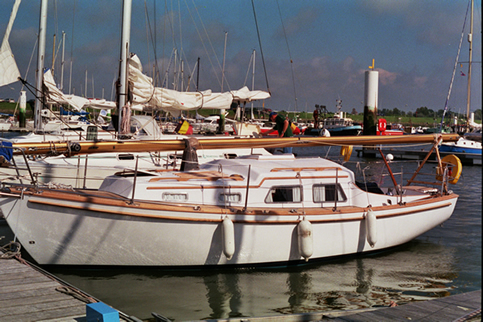 But on July 22nd, 1997 we moor again at our berth in the yacht harbour of the VVW at Novus Portus in Nieuwpoort. But because the dream of Hortó is always present, the boat will need more and even bigger restoration works before we will be able to realize our project. So later on the rigging has to be renewed: mast, boom, standing and running rigging, and sails are replaced. According the advice of Wittevrongel Sails and Rigging we keep " everything at the mast ". A few years later we start the renovation of the hull at the new Ship Support shipyard in Nieuwpoort. Replacement of the steel/concrete ballast inside the long GRP-keel by lead, peeling/stripping of the gel coat, applying of an epoxy water barrier: all very invasive and radical works. In the space won in the keel the yard laminates a 160 litres fresh water tank, the old GRP tank in the forepeack becomes a very useful locker. A new rudder - complete with rudder stock, stuffing box and gland - should influence favourably the performances. A radar seems to be an important contribution to the safety by sudden fog, a frequent phenomenon by hot weather during the summer on the passage of the capes of the Cotentin, the Normandy peninsula, and in the Channel TTS, as the experience learnt us! During the winter 2004-2005 we have it done to replace our small but faithful Yanmar 1GM10 engine by ... the same one: all two cylinders are just few centimetres too big for the space under the cockpit! Ship Support also installs a 50 litres flexible Vetus black water holding tank, an indispensable equipment from the ecological point of view as we think. The pipes of the self draining cockpit are enlarged, the teak seats and the duckboard replaced. We install a new NAVTEX-518/490kHz receiver: the reception is sharply improved and allows us even to receive in Nieuwpoort sometimes very clearly NAVAREA II and III messages. The icebox with Peltier-cooling system is replaced by a fridge with an energy-low Danfoss-compressor. For the trip to Mediterranean Sea the yard provides, during the wintering 2006-2007, the installation of an electric anchor lass; we also have it done to replace the gas stove, the pipes and the taps; we buy a second solar panel and order Ship Support to provide adjustable supports for the unstepped mast; they repaint the hull; Nehalinnia gets new batteries, charger and diesel heater with pulsed air. We order a light stern anchor, a Fortess 16, and the improvement of the stern anchor gear. A nice and comfortable cockpit tent enlarges the living space on our small boat; the transformation of this tent in a solid bimini provides sun protection during navigation. In the harbour or during a long anchoring, a light tarpaulin cunningly conceived by Guy Toussein will supply shadow and (relative!) coolness; we have also a wind scoop . A second tiller pilot has to contribute not only to the comfort but also to the safety. Log, sounder and anemometer were replaced in 2001 so now we replace the old VHF receiver by a GMDSS DSC-VHF-class D with ATIS; meanwhile both we obtain the SRC certificate required for this VHF receiver. 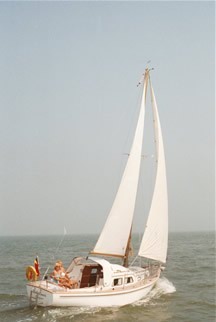 Nehalinnia can use, on the Furlex reefing system two new, different foresails: a genoa and a high aspect tri radial jib. In the opinion of our sailmaker Wittevrongel the mainsail is still in good condition, renewing is not actual; but we ask him to take al measurements for a replacement in the future. An asymmetric spinnaker and an orange fluorescent storm jib make the wardrobe complete. The mast and the standing rigging are checked meticulously. The old dinghy that we bought second hand is replaced: after a long search at all different models and types we find a round tail 2,30m long tender, that we can easily put in one of the cockpit lockers, well equipped for our 2Hp-4T outboard. Life jackets and life raft are serviced and controlled by the SKB station in Ostend. rapidly we get problems with the Y gate of the holding tank. After replacement by an identical one, we get new problems and decide to replace it during the wintering at Menton Garavan by a hopefully more reliable solution. The new gate is custom made and consists of a short stainless A4 rounded Y pipe and two high quality ball valves; the whole gate can easily be dismantled and is not really bigger than the plastic one in which the brass shaft was coming out of the plastic housing. for a really good fixation of left and right incoming mooring and lazy lines and the stern anchor line, we have installed a stainless A4 fairlead on starboard too. after the crossing of France by the canals and the navigation along the French Med coast we have to replace the water pump of the direct cooled Yanmar 1GM10 due to too frequent leaks; we service the old pump - replacement of oil seals and the shaft- and keep it as spare part till we bring a new one from Nieuwpoort at the autumn 2008.
we get the by Ship Support built passerelle adapted: double fixation system: a pivot with articulation for the pulpit, an U stainless profile for fixation on the ladder or on the pushpit. Spring 2009: - when hauling out after the wintering 2008-09, we notice that on the hull - which we had Ship Support repainted before our departure in 2007- the paint is coming off at some places on the waterline. Is this the effect of the prolonged contact with the water, or a to heavy high pressure cleaning, or a paint-sanding-adhesion problem? Ship Support in Nieuwpoort and Paleros at Lefkas give different explanations. Due to the urgency - we have to haul in in two days - we have the small repairs done by Paleros. - for the stern anchor warp of the Fortess 16 we have a stainless steel A4 box made by Steel Marine (" Phil the Steel ") in Nidri, fixed on the pushpit; 4/5 of the 40 m long warp in it, the leaded part is coiled up around the anchor shank and secured by a rope. Spring and summer 2010: - during our stop in Reggio di Calabria, two years ago, we had to replace our batteries then only one year old. But now we notice that these batteries should be, again, replaced soon. The installation which during almost fifteen years gave satisfaction does not correspond any more to our use: we thus decide to modify our system which includes only two batteries of 80Ah in parallel, a charger and a switch. 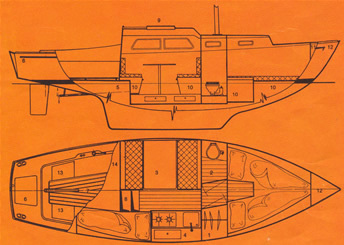 In the magazine Boat Owner the renovation of the electric installation of a Vancouver 27 was clearly explained. We decide to be inspired by it and to ask for the execution Yacht Electrics (mobile 6938569143), recommended by many sailors here. Two days later, to our full satisfaction, the renewed system is in use: besides our Dolphin battery charger, the switch and two new service batteries ( 2x90Ah) we have now an (apart) engine battery ( 62Ah), diode, shunt, Sterling Power advanced alternator regulator and power management panel. Winter 2011: unexpected works on the underwater hull. As we have already mentioned on this page we made realize important and expensive renovation works on the hull of our sailing boat: with the aim of the trip to the Mediterranean Sea some years later, the ShipSupport yard in Nieuwpoort applied a protection treatment against osmosis. We knew that during the voyage the boat would stay for a long time in the water and would winter probably afloat. We wanted to spend the winter on board in Menton and we did not plan to leave the boat during several months in Greece for spending the winters in Nieuwpoort, this being not at all part of our project! The original ballast - concrete and steel - in the long keel is replaced by lead fixed by a special resin, a new water tank is installed in the free space and a complete new rudder system is built. 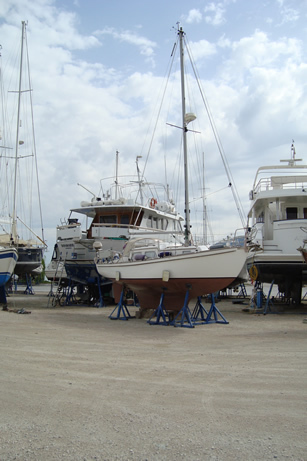 According to the conditions of the three years warranty, the boat is checked every year by ShipSupport during the winter storage in the shed, when we make them make the other works until our departure for the Mediterranean Sea in 2007. Then the boat winters afloat at MENTON-GARAVAN F ( 2007-2008 ) and at LEFKAS-MARINA GR ( 2008-2009 ). During the hauling out for the maintenance we notice nothing of abnormal except that - in March 2009 - the boot-topping comes off on about twenty centimetres during the the high pressure cleaning of the hull. This small repair is made at Lefkas and we inform ShipSupport who has repainted the hull and so also the waterline before our departure. But when at the end of April 2010 we haul out the boat, we find, scattered on all the hull, big blisters. 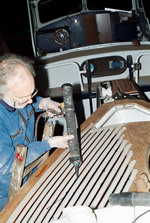 The cleaning of the hull has to be done carefully because in numerous places the epoxy is completely coming off. We ask a British surveyor for advice. He wants to know what products the yard has used but above all he wants to know how many times the hull was rinsed after the peeling of the gelcoat and before the epoxy was put during the anti-osmosis treatment of 2003. To be able to give him answers we then call ShipSupport. We are not really helped by their answers: the products are mentioned on the invoices of 2003 (but we do not have them here in Greece! ); they had rinsed the hull certainly and at least once and the inside of the keel, after removing the ballast, even several times; and, " the boat was dry when the treatment started ". We get also some reassuring words: " Van een paar blazen, daarvan zal ie wel niet zinken! 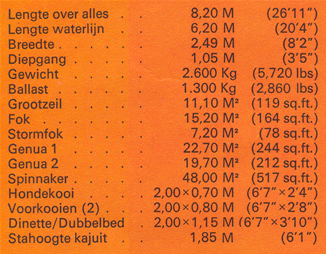 Jullie kunnen gerust zo nog een paar jaar doorvaren " [trans. Due to a few blisters, the boat will not sink! You can continue sailing in complete peace during some years ".]. We are really not reassured: how could we apply the anti-fouling during the coming hauling out on an undercoat which is coming off? Furthermore It seems impossible - unacceptable - that a treated underwater hull yearly checked according to the conditions of warranty during the winter storage inside the ShipSupport yard (2003-2007), gets a big problem after only 3 years afloat (2010). 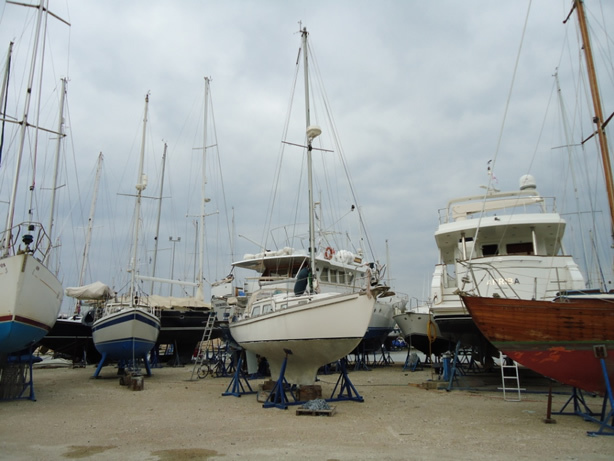 As we are in the beginning of the season and as we have reserved the hard standing of the boat in Lefkas Marina only for one week - the time for spring maintenance - we decided in agreement with the surveyor, to paint the antifouling as well as possible. Then we launch the boat again. At the end of the season we will haul out again and in meanwhile we will see the different possibilities. Having sent by email pictures of the hull to ShipSupport - an email for which we get no other answer than an acknowledgement of receipt -, we have by the intervention of the surveyor an appointment with the British owner of Ionian Composites-Ionian Glass fibre Repair yard, specialized in this kind of GRP problems and which enjoys in Lefkas and more of an excellent reputation, e.g. by the numerous foreign community. 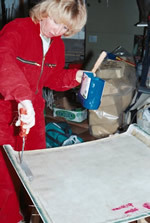 According to the surveyor and Ionian Composites-Ionian Glass fibre Repair expert, there are two very likely hypotheses to explain the problem: either a totally insufficient frequency of rinsing of the polyester after the peeling of the gelcoat (the most frequent cause of second recurrence), or a problem during the treatment ( incompatibility of the used products, condensation just before the first coat a.o. ). Nevertheless both underline that they can say this so far as it's certain that the hull was really dry enough when the treatment was started, what is declared by ShipSupport. October 20th, again, we haul out the boat. We see that the the problem is a lot worse: it is now not anymore possible to clean the hull by high pressure without the antifouling and epoxy coats coming off on important surfaces. We are afraid that it will get worse year by year (or even month by month?) and we don't know how we could paint a new ( holding ) anti-fouling. Both, our surveyor and the GRP specialist examine the boat before our departure for Belgium on October 25th and they confirm their hypotheses.
" The yard made the job well " ( was this "expert" present? ) - [and this are the] possible causes of the problem: 1. " Because of the long sailing the boat became more " lung ", so that the harder epoxy gets loose from the hull " ( thus some more years of sailing and the boat will disintegrate totally, quite like all these other cruising boats, a worldwide disaster?! Let us urgently inform all about this so precious expertise ) 2. " Travelling in warmer waters " ( so, let's all sail to Iceland and don't forget the global warming and the unexpected consequences for boats !? ) 3. " The old polyester can provoke a reaction with the [modern] paint systems " ( let us follow a little this reasoning: why then have they treated our boat in 2003? but now all the shipyards the world which knowing this excellent expertise urgently have to stop treatments on older boats, and because only the new boats can be treated, it will be a terrible economic loss, all these yards closing their doors due to the lack of customers ! ?). We are at that moment at the beginning of December. Since then we heard nothing more on behalf of ShipSupport. Winter 2011, on the hard at Lefkas Marina, Nehalinnia sanded again: only seven years after the treatment by ShipSupport in Nieuwpoort (B), for a time back to the start. Now it's waiting for the finishing works by Ionian Composites-Ionian Glassfibre Repair of Leslie Wood. 01.05.11 Nehalinnia is moored since last Tuesday - 26th April - at her berth in Lefkas Marina. 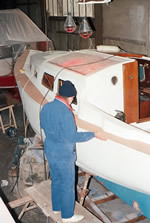 - end of March and April 2011: the bottom is filled using a filler made using DOW 321 Epoxy ; then faired into shape; after this, five layers of DOW 321 resin is applied, followed by four coats of International Gelshield Epoxy Primer; after that six layers of Coppercoat anti-fouling; the blue waterline was little higher painted on the epoxy barrier. ===> We have been well informed about the progress of the works; Penny and Keith (s/y Sea Trek) and Christine and Guy (s/y M.Balthazar) have sent us pictures too; Maureen and Mark Wicherley were taking care of our boat. May 2011: Besides the important routine maintenance prescribed after 1200 engine hours ( e.h.) again we have to replace the direct cooling pump, after 593 e.h. (on a total of 1178) due drain hole leaking, also making rusty the high pressure oil pipe. By experience we know that replacing the SPI-seals without replacing the small shaft does not bring a solution because the slightest wear on the shaft will still make leak the pump. The replacement of the seals is rather difficult without the appropriate tools and a workshop. That is why we always have a spare pump ready for use. Our engine was installed in 2005 and counts now 1178 hours. The pump was replaced a first time in 2008 after 585 e.h. just before we left Menton (F), thus after the crossing of France by the canals and the sailing along the French Med coast ( see here above ). We have also to replace the high pressure oil pipe (in 2006 some rusty traces have already appeared which were treated by ShipSupport using a special paint. Replacement also of the exhaust mixing elbow due to rather sudden rust and light oozing. We are worrying about the quality of this new Yanmar 1GM10 engine whom we made install six years ago in replacement of the identical which was then 17 years old. According to the ShipSupport yard there was due to the lack of space no two cylinders with (indirect) fresh water cooling - intercooler - on the market that could be installed. We thought of having bought and received all spare parts we needed - from ShipSupport on our departure in 2007, and during the last winter from Turbo's Hoet until Simon Trippier, the British technician who runs Sivota Yacht Services (MOB 0030.6946580785), notices that some gaskets are missing. They were immediately ordered at Yanmar Athens - and at Turbo's Hoet in Nieuwpoort when we were thinking that the Greek delivery could be longer. As soon as the parts arrived at Lefkas Simon came to assemble and service the engine.